Sometimes you just need chocolate. Know what I mean? Yeah. So. I often enjoy my chocolate in the form of a smoothie, because smoothies are like milkshakes, and for one as deadly allergic to milk as me, a milkshake sounds grand! Because I’m trying to lose weight (85 pounds to day, lots more to go), I eat a ketogenic paleo diet. That means low-carb. This smoothie is low-carb, high in fat (also good for ketogenic), and contains all paleo-friendly ingredients. It’s also super filling. I just had about a third of the recipe this morning, and I think my stomach may explode. Yesterday I had the first half of the recipe at about 10 AM and had no desire for food until about 5 PM. Here’s a secret. You can use water to adjust the thickness of the smoothie, so you can actually make it like pudding, too, if you prefer to eat your chocolate with a spoon. Stick it all in a blender and blend until smooth. Add water to adjust the consistency to your desired thickness. Yields 2-3 smoothies, and it will refrigerate well for a day or two. Just add a bit more water and re-blend when you’re ready to have it the second day. So before I go, I have one more announcement. 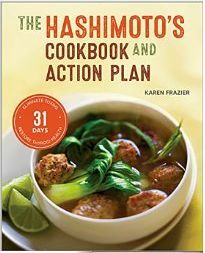 Rockridge Press has published the cookbook I wrote: The Hashimoto’s Cookbook and Action Plan: 31 Days to Eliminate Toxins and Restore Thyroid Health Through Diet. It’s a modified Autoimmune Protocol (Paleo AIP) with special consideration given to foods that may affect the thyroid.